If you love Road Trips and you’re dreaming of going on one in USA, there are some places that shouldn’t be left out of your schedule. Apart from the coastal and heavenly Los Angeles - San Fransisco route, which is one of my favorite, I recommend you tick some “Real American” cities in your list too. There are for example, some provincial cities, not cosmopolitan at all, but with amazing hiking trails and dreamy sights. Somewhere in North Arizona, there is a city named Page and it is just like it came out of an encyclopaedic book. I visited this city three years ago and I came back this year to re-go on this exciting trip to Horseshoe Bend. Driving to Highway 89, crossing Nevada, Utah, Arizona and being only a few hours far from the dreamy Monument Valley, I decided to make an epic stop at this unique spot! It is a natural marvel, a scenery surrounded by stones and red rocks, creating thus an actual horseshoe in which river Colorado flows. The river reaches this spot through the dam of Glen Canyon which holds lake Powell back. It is just 5 km from where Grand Canyon National Park starts, giving you the sense that you are literally in its area. In a geographical aspect, it doesn’t belong to the Grand Canyon yet it is like a peripheral extension of it, like many other Canyons in the area. After leaving and saying goodbye to Utah, the highway 89 led me to the dream of Glen Canyon! >> You have no idea how to organize a USA ROAD TRIP? Check out my detailed guide here! Once you are at the signaled area of Horseshoe Bend you will meet a huge parking, which is usually... crowded. Don’t worry, the Horseshoe Bend is a very famous sightseeing with thousands of visitors daily. Be prepared to even leave your car out of the Highway 89. Useful tip: don’t leave any precious objects at your car as you will be far away and probably won’t have time to get back in case somethings happens. However, there was police security when I twice visited. But, just in case, be prepared. Be ready to walk long enough from the parking lot to the view point. The trail is not that difficult unless the weather is too hot. Don’t panic though. There are also signs in different spots of the route that keep you in track. There is no bad time to visit it but the truth is that, each hour offers a totally different point of view! 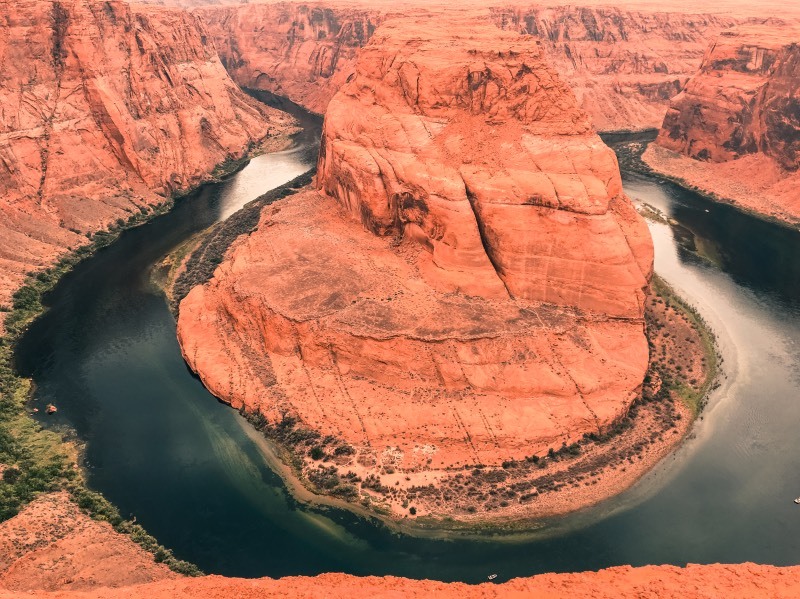 If you really want to visit Horseshoe Bend at the best possible time and with the best possible view, then you should choose the time of your visit carefully. The best hour would be in the early morning around 9-10 am, when the sun is right behind you and helps you enjoy the view, or in the early afternoon. A late afternoon would not be such a right choice because of the sunset; it is wonderful but it won’t be helpful in your photo shooting or enjoyment of the view. If you are a professional photographer, this might not be a problem to you, but if you are not, then avoid the sunset hours in your shots. Every spot is right. Every spot can give you a breathtaking view. However, I personally prefer the left side where I can enjoy the view more quietly, while most of the visitors try to find the right spot too. Let’s not forget that there are almost always photographers who stand with their special equipment on the centre, so this spot won’t be very convenient to you. But don’t hesitate to look around, there are other beautiful spots too! First things first; make sure you have water with you. You will really need it due to both the temperature and path. Also, you need to put on your trainers because of the dirt and bumpy road which is full of little rocks wherever you look at. Don’t forget your sunscreen especially during summer months and a camera to always “carry” with you what are going to see there. In general, there are no protecting barriers in the Horseshoe Bend, apart from one in the centre. So be extremely careful of where you re standing in order to take the perfect photo! The view is breathtaking as I already said, but if you are afraid of heights, I suggest you step a little back. FOLLOW ME ON INSTAGRAM and watch all the highlights with the breathtaking view! There are public toilets in the parking lot. If your visit is during the morning hours, you will probably meet hundreds of tourists arriving, so this might be a problem for the restroom. But don’t worry; there are many nearby shops in the city of Page, which you can visit for the same reason. There is no entrance fee for the Horseshoe Bend. It’s free. I know that you already have your snack supplies with you for this epic Road Trip, but you should really make a pit-stop at one of Page’s best American breakfast restaurants in the area. After spending two weeks at four states, I finally ate the best –by far- traditional breakfast at the Ranch House!